Have I ever told you just how much I despise alternating skeins of yarn whilst knitting? Well, I do. Especially on projects knit in the round. Items knit flat? Meh. I don't mind so much cause you can carry the yarns up along an edge and it can stay all neat and tidy. But in the round? Ugh. I utterly despise it. I totally get why you need to and should alternate skeins, especially when it comes to knitting with hand-dyed yarns and colours from different dye lots, but man... I'll admit that I try to avoid having to alternate skeins whenever I can, and sometimes I just get darn right lazy and don't even bother. At all. Sometimes I luck out and you can't tell where one skein ends and another starts. And sometimes...well...sometimes I turn a blind eye and hope that no one will ever notice. Myself included. I buy a fair amount of yarn online and have participated in a few rounds of the Madelinetosh Magnolia Society Sweater Club, and so that goes without saying that I don't always get to match up the skeins of sweater quantities myself. Obviously if the skeins are noticeably different from one another then I alternate skeins, but I have a few methods that I use to determine whether or not if I should alternate. One method is to knit the first half of my gauge swatch using one skein then knit the last half with a different skein. If I can't tell where I've switched skeins then I knit as normal. If there's a distinct line, dammit, I'm alternating those bad boys! 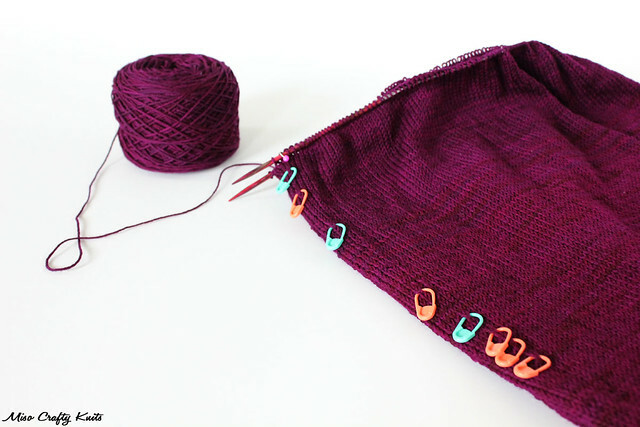 Another method I use a lot: if there's only 1 skein of the entire sweater quantity that is quite noticeably off, then I'll use it for wherever there's ribbing on the garment and on the button bands. But what if you don't have much yarn for a project and that 1 skein is badly needed for more than just ribbing and button bands? Easy, I use that skein for most of the sleeves too. Am I the only knitter who does this? What do you do? Can you see it in the photo? Can you see where I've started alternating? I noticed it when I was knitting away in the truck while waiting for Brett. I've checked it out in a few different lighting situations and I'm not sure if it's because I think there's a big difference and therefore imagining it, but I think I can see a noticeable difference. 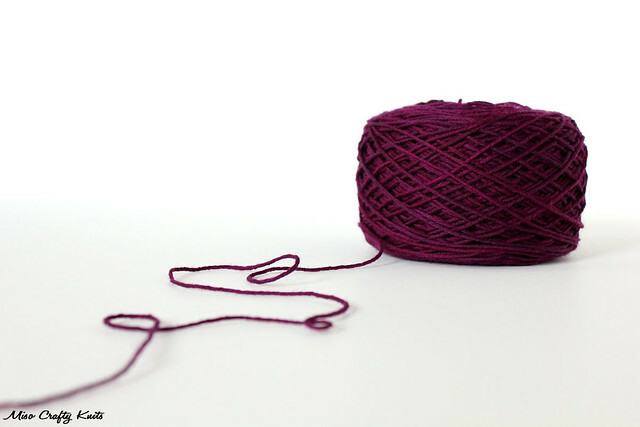 One skein is more of a pinky-red of a purple, and the other is more blue purple. Knitter's denial stepped in at that point and I just kept on knitting. I'm now at the shoulder shaping where I've lucked out in having to start knitting with the third skein (the darkest of the 3 skeins) as there's some garter stitch details that can "hide" the difference. I feel like I'm too far ahead to rip back now but I'm not sure if this bugs me enough to rip out the entire project. So good to know I'm not the only one that alternates the way I do...and uses the odd ball for the sleeves! :) I keep telling myself that non-knitters will never know and knitters won't be able to tell if it was intentional or not. I just have to figure out if it'll bug me too much or not! oh no! yeah, i know that whole "am i ripping the whole thing out or not?" feeling. sit on it for a day, i personally think it's usually less bad after the horribleness of first noticing has worn off. i ganked my georgia and just reordered the skeins (and knit grace instead) so i could hide the differences like you said up there and still not have to alternate. however, recently i don't think i'm so lucky. i bought the last 3 skeins of grapefruit madtosh sock eat sleep knit had and they are visibly different (the risk with buying the last of any yarn). and they're for the boxy too, no hiding in stitch pattern or construction with that one. looks like miles of stockinette is worth alternating for! yours doesn't look bad from the pics though, the colors are a little different yeah, but no one would notice if you didn't tell them, especially non-knitters who likely will see you wearing it more anyways. i hope when you wake up and look at it tomorrow you feel better about it! I'm definitely going to sleep on it and maybe sit on it for a while. I have a feeling that if I do something drastic that I might regret it seconds later. I've been so lucky in the past, but like you I think my luck has run out...starting with this project! Good luck with your Boxy and I hope you learn from my mistake and alternate your skeins! The grapefruit is going to look gorgeous as a Boxy! In the round is super easy... Just pick up the yarn from the row directly beneath.